It is a well known fact that the second book in a trilogy tends to be the weakest book of the series. It drags, it sets up the story for the epic conclusion, and it is simply an all-round fest of boredom for the reader. Mike Mullin’s Ashen Winter however, is (thankfully) one of the few exceptions to this rule. Ashen Winter is filled with danger, romance, and heart-pounding action that is certain not to disappoint. While Ashfall followed the story of Alex and his journey to reach his parents in Warren, Ashen Winter follows the journeys of Alex and Darla as they struggle through the freezing cold winter to find Alex’s missing parents. The story opens with the two finding a gun that belonged to Alex’s father in the possession of a bandit – a rogue who clearly has information about the current whereabouts of Alex’s parents. However, if Alex and Darla found travelling through the snow to reach Warren to be difficult, this endeavor only proves to be more of a challenge this time around as now the people are more desperate, more ruthless, and the weather has only turned more brutal. Furthermore, the support they have always depended on from one another just may be ripped away and Alex may find himself searching for more than just his parents in this scintillating sequel. In all honesty, I did not enjoy Ashen Winter nearly as much as I enjoyed Ashfall. 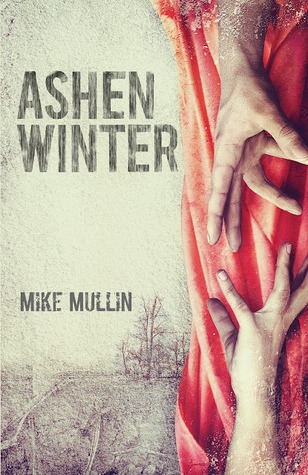 That being said, I still think that Ashen Winter was an extremely respectable follow-up novel to Mullin’s surprising debut and like its predecessor, it managed to keep my attention while I flipped frantically through its pages, unable to stop reading. What I liked best about Ashen Winter though, was the fact that Mullin really took human nature into account. In this novel, we are exposed to the more savage, unrelenting side of humanity and are shown to just what extents people are willing to go to get what they want and live. Ashfall showed us some of these extremes, but Ashen Winter truly went deeper. As more time passes by while humans are forced to survive in the raw wilderness that is now their home, a far more brutal and ugly side of despair and what it can do to you is shown. I felt as if all this was very realistically and effectively portrayed through Alex, who proves to be an engaging and empathetic narrator once more. Speaking of Alex, I really enjoyed seeing his character development throughout this novel. The volcanic eruption that turned his life upside down also managed to make him into a tougher, strong-willed, and more morally aware human being. His interactions with Darla, his family, and other complete strangers all slowly exposed different sides of him that we weren’t able to see as much in Ashfall and I think the manner in which he grew was very realistically portrayed as well. There is a lot more I wish I could say on the matter of Alex, but I would hate to reveal any more for fear of spoilers. Thus, I can only assure you that Alex continues to be the determined and faithful protagonist that we all fell in love with in Ashfall and Mullin only makes it easier for us to side with him, root for him, and revel in his unique narration. That being said, Ashen Winter did have a major flaw that I was unable to reconcile with. One of my absolute favorite characters was not present for over half of the novel and this loss was felt very keenly. Although I did like seeing the impact this had on Alex and how it drove the original plot-line of the story, I definitely would have enjoyed this book more if that character were present for just a little bit more of the book. In addition, I felt as if some areas of this story tended to drag and only the last couple of hundred pages truly seemed to pick up the pace. Yet, these are small qualms to have with such a brilliantly written novel and although I frowned upon them, I still managed to enjoy this novel despite it. Ashen Winter is a truly spectacular sequel to Ashfall - one that leaves you satisfied, on the edge of your seat, and waiting for more all at the same time. I can definitely admit that the most difficult part about reading this book will be waiting for the third installment in this amazing series to release. Mike Mullin has quickly become not only one of my favorite authors, but an author to definitely watch out for. Not only is his work extremely well researched, fantastically written, and remarkably balanced out with action, suspense, romance, and relationships, but he also does not hesitate to reveal the darker aspects of humanity and the gory parts of human survival. This series has quickly become one of my most anticipated reads every year and I can guarantee that fans of Ashfall will not be disappointed by this far-from-disappointing sequel! Thank you to NetGalley and Tanglewood for providing me with a copy of this book in exchange for a honest review. A truly spectacular sequel? COUNT ME IN! While I haven't read Ashfall (which I really need to fix! ), I'm glad that the sequel does not disappoint. I must get the first book so I can read the sequel soon! Thanks Celine! (: I hope you get to pick up Ashfall soon! I loved it and I reallly hope you do too! It's always so fantastic when a sequel is good and not just a filler book! I'm glad this book didn't suffer from second book syndrome, they really seem to tick me off. I didn't have the greatest time reading Ashfall, so I decided not to pick the second book up, but from your review it sounds like I'm missing out on a lot of awesomeness, you may just have twisted my arm to pick this one up. Mullin is definitely a super talented writer, his writing is epic. Another wonderful review Keertana, I hope you don't have to wait too long for the next book! I only read the first half and I quite liked it, but then I put it on hold and just didn't go back to it. This rarely happens to me, but in this case, I think it has a lot to do with the absence of a certain character. I will definitely go back to it, no question about it, and it makes me feel better that you weren't disappointed, even if it wasn't as good as Ashfall. "In this novel, we are exposed to the more savage, unrelenting side of humanity and are shown to just what extents people are willing to go to get what they want and live." That is EXACTLY what I loved about Ashfall Keertana! I'm so glad to know Ashen Winter delves even deeper into human nature when we go into survival mode, that makes me want to pick this book up immediately. I'm curious as to which character is absent for most of the book though:) Gorgeous review as always! ooooooh this looks great! Once I catch up on my current reading, I'll have to start up this series. Great Review. The series sounds good, but I'm iffy about it. I like dystopian but I'm not a big fan of it. I understand, Sarah. If it changes your mind though, this one is more of a post-apocalyptic novel than anything else, but I do see why you'd be off-put by the genre of this one. Not everything is for everyone, but thanks for stopping by nevertheless! Oh gosh. I got an ARC of this months ago but I totally forgot about it. I gave Ashfall a 5/5 so I'm definitely looking forward to reading this. I think I know what you mean about the flaw. Ashfall has its flaws too, but instead of disliking it, I end up loving it more because of those flaws. Thanks for the amazing review, Keertana! Stunning review, Keertana! Even though this one wasn't quite as enjoyable as Ashfall (since the middle book never is), I'm glad you were pleased with this book overall. I've heard such great things Mike Mullin, his books and personality on social networking and book sites both. Okay, I haven't read rthe first book yet, so I only skimmed your review in case there's any vague spoilers. But what I have gathered is that it's an effing BRILLIANT sequel to Ashfall. Often I do worry about sequels for the very same reasons you mentioned in your first paragraph. So it makes me insanely excited and so much more EAGER to read Ashfall knowing I have an equally compelling follow up. THANK YOU FOR REMINDING ME I WANT TO READ THIS. And SOON. I chose the rating as I had read the first one and even though the fact that I didn't really get that into it I got the second one anyway and it kept my attention throughout the entire book I did t want to put it down.